Successfully Added Double Laser DMX Projector with Sound Activation to your Shopping Cart. 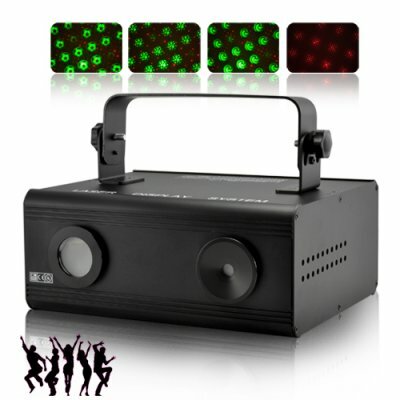 Sound Activated Double Laser DMX Projector - get the party started in style! With 3 available play modes (sound activation, automatic, and DMX 512), this laser projector emits beautiful red and green laser patterns that is perfect for all occasions, from home parties and raves to high class bars and nightclubs. This laser projector is built with a durable outer aluminum casing and packed with a high tech N1.8 high precision stepper motor to emit stunning effects with 2 single Red and Green lasers. On automatic mode, random patterns will be displayed to liven things up, but when set to sound activation mode does the party really get started as the patterns will change speed and direction in response to the music. Surprise your friends and guests with beams displaying and alternating funny shapes at music rhythm while you are playing the DJ! To increase the sound sensitivity according to the craziness of audience, just adjust the volume control and the MIC will then interpret sounds differently and emit different patterns. For the pros out there, here is the best part; located at the rear of this laser projector are two DMX ports. These ports can be connected using DMX cables (not included) to a compatible DMX lighting control unit, which allows you to control the built-in laser patterns and house lights while you are spinning the music, thereby increasing the flexibility of this unit even further. Create new and attractive atmosphere at your club or summer event by letting people make fun of drawings appearing and disappearing on their shirts as fast as sound beating the air! This Laser projector can be mounted anywhere that suits your needs and is adjustable to easily be aimed at any area, whether it is a wall, ceiling or even the dance floor. With an adjustable bracket suitable to allow installation at any angle, this is perfect for installation in any indoor environment, including parties, disco, balls, dances, raves, bars, nightclubs even in your living room for the best chill out "session" while listening to your favorite lounge music. Available in our warehouse now, order today and we'll express ship it out tomorrow. Brought to you by the leader in China Electronics - Chinavasion. When using the CVLC-LT01 projector, it is recommended to place the projector next to the base unit of your sound system. The MIC on the projector will then pick up the vibrations in the sound wave and start to dazzle everyone with its exciting laser light projections and pattern designs. Does the CVLC-LT01 come with a remote control? Any! The projector will detect changes in beat/rhythm, but is best used with loud dance or hiphop music. Make sure it is on sound activation mode instead of auto. Also, make sure the music is being played near the mic on the back of the unit.